DISNEY’S ALADDIN AND HELLO, DOLLY! 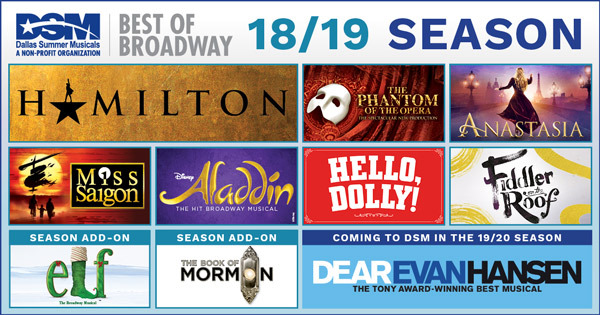 Dallas, TX January 13, 2017 – Dallas Summer Musicals, Inc. (DSM) and Broadway Across America (BAA) are thrilled to announce the full lineup of Broadway shows coming to Dallas as part of the 2018-2019 season, as well as DEAR EVAN HANSEN, which will headline the 2019-2020 season. Joining previously announced HAMILTON and Disney’s ALADDIN is Broadway’s most beloved musical, the 2017 Tony Award® winner for Best Revival, HELLO, DOLLY!. Also announced are Cameron Mackintosh’s spectacular new production of Andrew Lloyd Webber’s THE PHANTOM OF THE OPERA; the romantic and adventure-filled new musical ANASTASIA; the legendary story direct from Broadway, MISS SAIGON; and a gorgeous new Broadway production of FIDDLER ON THE ROOF, directed by Tony winner Bartlett Sher. In addition, DSM and BAA are pleased to welcome back two audience favorites to Dallas as Season Add-Ons. The musical for every-BUDDY, ELF, based on the film of the same name will return to Dallas just in time for the holiday season. By popular demand, THE BOOK OF MORMON, winner of 9 Tony Awards including Best Musical, will also return to Dallas for a limited one-week engagement. It was also announced that the winner of six 2017 Tony Awards, including Best Musical, and 2018 Grammy Award® nominee DEAR EVAN HANSEN will play Dallas as part of the Dallas Summer Musicals 2019-2020 season. Declared “One of the most remarkable shows in musical theater history” by the Washington Post, DEAR EVAN HANSEN is a new American musical about life and the way we live it. DEAR EVAN HANSEN features a book by Tony Award-winner Steven Levenson, a score by Academy Award® and Tony winning composers Benj Pasek & Justin Paul, and direction by 4-time Tony Award nominee Michael Greif (Rent, Next to Normal). The Original Broadway Cast Recording of DEAR EVAN HANSEN, produced by Atlantic Records, made an extraordinary debut on the Billboard 200 when released and entered the chart at #8 – the highest charting debut position for an original cast album since 1961. A special edition coffee table book from Pasek, Paul, and Levenson, Dear Evan Hansen: through the window (Grand Central Publishing / Melcher) is now available, offering an in-depth, all-access look at the musical, including never-before-seen production photos and cast portraits, behind-the-scenes stories, and a fully annotated script by the authors. “The stage is set for another amazing season at Dallas Summer Musicals. With so many hits direct from Broadway, we continue to fulfill our promise of bringing the best of Broadway to North Texas. It’s the season everyone’s been waiting for, so don’t miss your chance to be in the room where it happens!” says Kenneth T. Novice, DSM President. “We are so proud to partner with Dallas Summer Musicals for what is sure to be a record-breaking season at the Music Hall at Fair Park! This season will be one that will be talked about for years to come,” said Lauren Reid, COO of the John Gore Organization – the parent company of Broadway Across America. Dallas Summer Musicals’ seven-show subscription packages start at just $204. That’s an average of about $30 per show. Current subscribers can begin renewing their current seats beginning at 10 a.m. on Saturday, January 13, 2018. New subscriptions will also be available beginning at the same time on January 13. Subscriptions can be renewed or purchased online at DallasSummerMusicals.org or by phone at 1 (866) 276-4884. DSM and BAA will have the Subscriber Hotline open for special hours on January 13 from 10 a.m. to 6 p.m. The hotline will be closed on January 14, and, beginning January 15, the regular hours will be Monday through Friday, 10 a.m. to 5 p.m. Subscriptions can also be purchased in person at the Box Office at the Music Hall at Fair Park on January 13, 10 a.m. to 6 p.m. and starting January 15, Monday through Friday 10 a.m. to 6 p.m. and on Saturdays 10 a.m. to 4 p.m. A four-installment payment plan is available to both renewing and new subscribers. In addition, subscribers who renew or purchase a new subscription will have first access to purchase tickets for the Season Add-Ons ELF and THE BOOK OF MORMON. Perks of being a season subscriber include the interest-free payment plan, savings over day-of-show single ticket pricing, the exclusive privilege to exchange tickets if they can’t make a performance, and priority access to tickets for the Season Add-Ons before anyone else. Subject to availability. Plus, 2018-2019 Season subscribers will have first access to tickets for DEAR EVAN HANSEN when they renew their subscription for the 2019-2020 season. Groups of 10+ can begin placing orders on Monday, January 15. Groups who place their orders before tickets go on sale to the general public will get priority seating, a 15% discount to the Crystal Terrace for groups of 20+, and many other great perks. Group minimums and discounts vary by show. Seating locations for group orders may not be confirmed until later this year. Group tickets may not be available for HAMILTON. For more information or to order group tickets, please call (214) 426-4768 or email groups@DallasSummerMusicals.org. Cameron Mackintosh’s spectacular new production of Andrew Lloyd Webber’s THE PHANTOM OF THE OPERA will come to Dallas Summer Musicals as part of a brand new North American Tour. Critics are raving that this breathtaking production is “bigger and better than ever before” and features a brilliant new scenic design by Paul Brown, Tony Award®-winning original costume design by Maria Björnson, lighting design by Tony Award®-winner Paule Constable, new choreography by Scott Ambler, and new staging by director Laurence Connor. The production, overseen by Matthew Bourne and Cameron Mackintosh, boasts many exciting special effects including the show’s legendary chandelier. The beloved story and thrilling score – with songs like “Music of the Night,” “All I Ask Of You,” and “Masquerade” – will be performed by a cast and orchestra of 52, making this PHANTOM one of the largest productions now on tour.